A\t the head table, Director General in the Min. of Foreign Affairs, Audrey Waddle, VP and Min. of Foreign Affairs, Carl Greenidge, Ambassador Rudolph M. Ten-Pow, and Consul General to New York, Barbara Atherly, during the town hall meeting. Sept. 29, town hall meeting at York College, was clearly a success, since many pressing questions were answered by Guyana’s VP and Minister of Foreign Affairs, Carl Greenidge, who, after issuing his statement to the United Nations 73rd GA, and a hectic week of bilateral meetings, addressed topics that included the Guyana territorial controversy, Guyana’s oil and gas sector, migration, charitable donation red-tape, and the disbursement of oil revenue to poor citizens. Ambassador Rudolph M. Ten-Pow, Consul General Barbara Atherly, and Director General, Ambassador Audrey Waddle, joined Minister Greenidge, during the wide-ranging presentation. The politician reminded nationals of the hardship Guyana experienced under various Venezuelan leaderships for many years, with Venezuela sparking a standoff in the disputed border region a while back. “Guyana, as recent as February 2018, presented documents to the International Court of Justice indicating that Guyana in keeping with the decision of UN Secretary-General António Guterres, submitted a case requesting the controversy by Venezuela, an arbitral award handed down in 1899 as null and void. The courts will protect the rights of Guyana,” he noted. In answer to why more than 2000 Venezuelan nationals were not accounted for after crossing the border into Guyana, Minister Greenidge pointed out that it is difficult to monitor the vast border lands to keep an accurate account of illegal immigration, adding that it was challenging to manage who comes and goes out of the country. He also reminded expatriates of the free-flow of nationals and pointed to his grandparents who were from Suriname and Barbados, adding, Guyanese too, migrate to all parts of the world. The petroleum that was found in 2015 in commercial quantity, Lisa 1- and nine other finds, will help to develop Guyana. Ranger 1, he added, is yet to be finalized but will produce four million barrels of oil, per capita. This is the largest quantity oil find in the world, other than in the Middle Eastern country of Qatar. 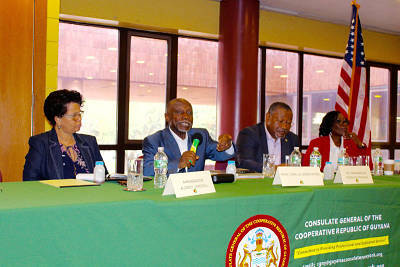 Devising ways to help diaspora organizations donate medical supplies without red tape, Minister Greenidge directed citizens to Director General Waddle’s office at the Ministry of Foreign Affairs, stating he did not want to burden the New York consulate with added work, but assured that this process would be handled in a more efficient way in the future. He explained that a Memorandum of Agreement with the Chinese government was only an agreement. The only loan from that country was used to complete an ICT funded project, which the Minister of Finance, Winston Jordon approved. Any loan contract has to be approved by a country, and signed by two parties, noted the politician. He called on the media in Guyana, to be more responsible in reporting, noting that all of his engagements are transparent, but agreed that the government needs to meet with citizens regularly to cleanup misconceptions, and promised that ministers of government would find ways to meet with the New York diaspora whenever necessary. The town hall, organized by the Guyana Mission to the UN and the Guyana Consulate to New York, left members of the diaspora with a clearer understanding of Guyana’s planned development strategy, and despite a protest outside York College by some Guyanese, from the opposition party, the well informed discourse garnered much applause.